arms, painting projects, spring is here! New Paper Kites is always welcome - this song is so soothing. For as long as I can remember, I've loved taking things apart to examine how they worked. There's something about knowing exactly how something works that makes me a lot more comfortable owning it. I don't know if that makes any sense... basically, I like knowing that I can fix any of my own belongings if they happen to break. This doesn't always work, because most things are a bit too complicated for me. For a long time, that's why I preferred shooting film - I knew how those cameras worked and trusted myself to put them back in operating condition if anything ever went wrong. Not so easy with digital...but I've gotten over that one (maybe?). I also enjoy painting things, customizing things, and generally making things "my own". I find that once I do that, I get really attached to things and want to keep them forever - otherwise, I generally have very little attachment to objects and probably buy/sell them at a questionable rate. Anyway...bikes! I bought a "mini-velo" about 2 summers ago. I like small wheeled bikes for their maneuverability, light weight, and small size. I wanted something that could fit into my dorm in the winter and be easy to carry up stairs if necessary. Small wheels are also way more fun to ride in the city (albeit quite a bit slower). BMX bikes can be a bit sketchy to ride, so I found one of these mini single speeds. They're super popular in Tokyo and other places with smaller living quarters, but there's only a few companies that make them in the US. 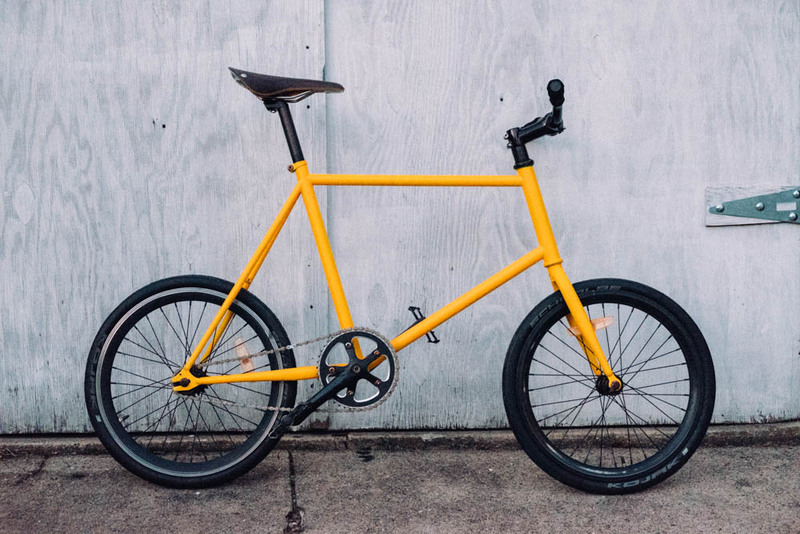 I chose this one because of the geometry and steel frame. 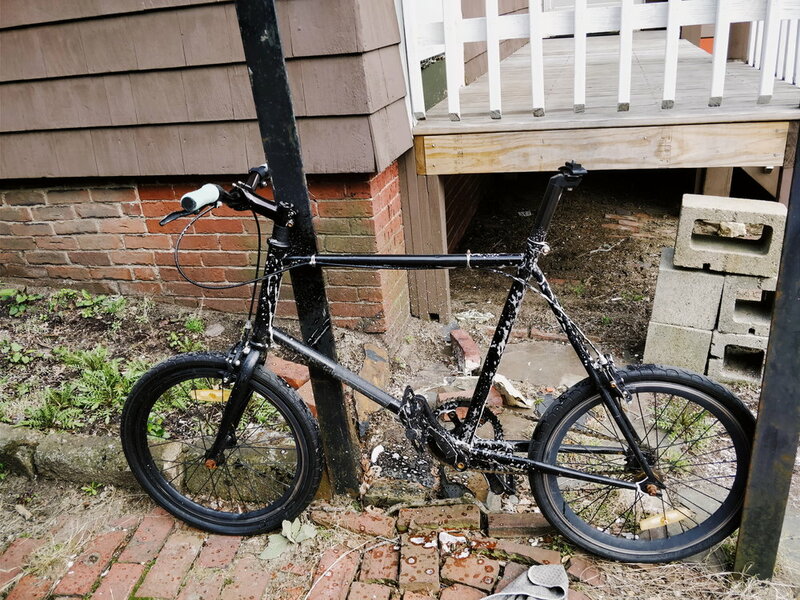 This bike has been through a lot. This is what it looked like (with some soap on it for cleaning, because I forgot to take the picture of it covered in mud). The gaff tape is to cover the logo of "Respect Cycles" - the name is ironic because apparently they have terrible customer service and a lot of people who order them never receive them. Sketchy, but I still love my bike. Getting rid of that logo was a big part of why I wanted to paint it in the first place. Stripping the bike of all components was more difficult than expected. There's so many tools required, but with the help of a local bike shop and a new bike toolkit, it eventually happened. And now...paint. I thought about a variety of different colors but yellow is the color of friendship and it makes me really happy so it wasn't much of a real consideration. I sanded down the frame with some medium fine grit sandpaper before spraying in the booth at work. The spray booth didn't really fit the whole frame that well, and getting to all the corners was a bit difficult. I eventually got most of it, but there are some parts that look slightly green because I didn't get enough coats in before I ran out of paint. Most of those spots are on the bottom or covered by other components though, so it's okay. 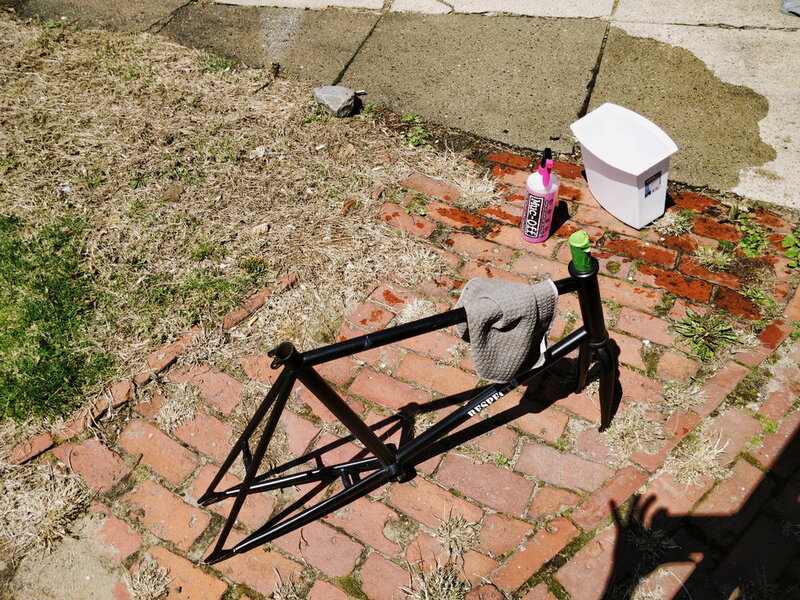 I got the paint from a company called "Spray.Bike" and their paint dries super fast, so I was able to reassemble it about 12 hours after painting. Final product! I need to get new brake cables so that's still a work in progress, but the photo is cleaner without brakes anyway. I'm really excited to bike and enjoy the above freezing weather that has at long last arrived in Boston. Sunset at a park new my apartment with the creepiest looking trees and a nice view of the Boston skyline. SF Chinatown on a work trip a few weeks ago. A wonderfully textured shot of the Charles River at exactly the right time of day.